When you open the box you’re greeted with what looks like a tank built for war, absolutely gorgeous finishing with really tactile knobs and buttons. Setting it up was a breeze, being a bus powered card, you just require to plug into the USB to use its outputs. The bundled power adaptor is built very well, including multiple plugs suited for different power sockets. It however misses a power switch, so you will have to turn off the mains or unplug the power adaptor. The interface was recognised without the need to install any drivers, the ID utility provides some very cool options customising the buttons on the interface, the ID button can be set to mono / phase invert / dim / talkback and the big encoder serves as a quick mute button when pressed and can also act as a mouse scroll wheel (any scrollable are your mouse is currently pointing at works), so this can be useful during mix down sessions to scroll up and down real quick without reaching for your mouse. These are just some console grade practices Audient has put in. The 2 way display ensures that changes done on the hardware reflect in the software and vice versa, for example if you change the volume via the software, you’ll see the ladder lights move on the interface reflecting the changes.However there’s no monitoring on the interface for inputs. Sound quality is pristine with really shining highs, deep expressive low end breathing new life into our Dynaudio BM6 monitors. We’ve never heard an audio interface in this price range perform such high quality conversion and playback. The iD14 uses Burr-Brown AD/DA converters and has a separate Class-AB headphone output and high-impedance J-FET DI input jacks both on the front panel.There is up to 56 dB of gain, a 2.8k-ohm input impedance and a +10dB input gain boost. The back features two channels of Audient’s classic mic pre-amps from their ASP8024 console and the main outs covered by 1/4-inch jacks. The front features instrument DI port and an independent headphone output which again ensures pristine conversion.We recorded a few analog synths in, audibly outstanding clarity and a very low noise floor. I/O capability is excellent,a digital optical input port which allows for operation either using stereo optical S/PDIF connections or ADAT (up to eight channels over SMUX), both of which will allow for operation at up to 96kHz. This small box with the ADAT expander allows you to record upto 10 inputs in parallel allowing you to track or record an entire band directly. 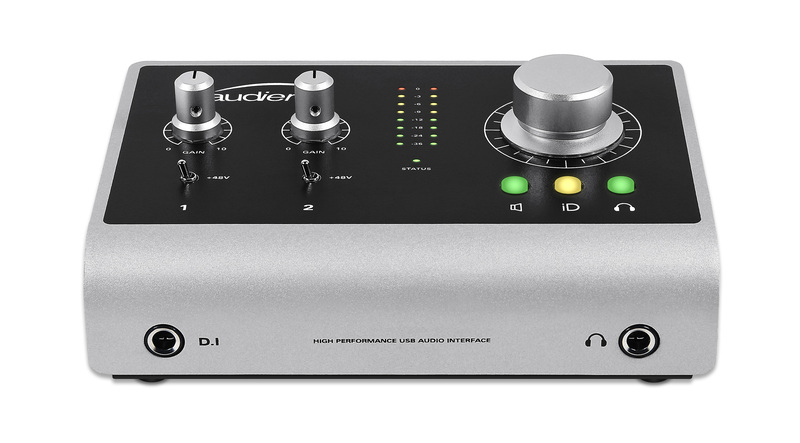 Conclusion : If you're looking at a budget audio interface, the iD14 is the best sounding and built interface we've heard in the price range and is absolutely worth upgrading to.